Is Gorkha Janmukti Morcha (GJM) president, Bimal Gurung, who is facing UA(P)A charges and gone underground, getting alerts about police raids to arrest him? This question is haunting Criminal Investigation Department (CID) sleuths in Bengal as Gurung managed to give the police the slip for the second time. Acting on intelligence inputs on his hideout at Namchi in South Sikkim, CID sleuths conducted a raid at the resort on late Saturday evening. “He managed to escape just minutes before the raid. A team of Sikkim police also accompanied Bengal CID,” confirmed an official from West Bengal home department. Gurung narrowly escaped arrest from another resort at Namchi on August 31. A CID team raided a location where Gurung was chairing an underground central committee meeting of GJM. Although CID sleuths managed to arrest nine GJM leaders, Gurung somehow managed to escape. 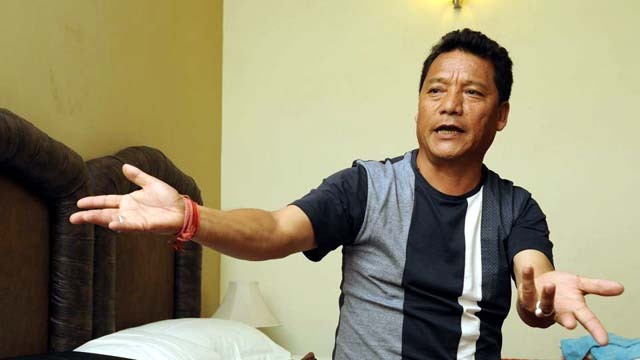 After that escape, tourism minister Gautam Deb even alleged that Sikkim police cordoned off Gurung and allowed him to flee. “In both the instances the raids were conducted after informing Sikkim Police, who accompanied the sleuths of Bengal CID. It seems too much of a coincidence that Gurung managed to escape on both occasions by accident,” the state government official said. Now, the question going around in Bengal’s bureaucratic and police circles is that whether moles are active only in Sikkim Police, or are in Bengal police as well. “The situation is very tricky,” added a state government official. Significantly, Sikkim chief minister Pawan Kumar Chamling has backed the demand for Gorkhaland soon after the latest chapter of violence started on June 8 in Darjeeling. He even wrote to Union home minister Rajnath Singh, expressing support for a separate state. “We all are aware that Sikkim and Darjeeling share a very close bond with similarities of language, culture, tradition, caste, food habits etc. As immediate neighbours, we Sikkimese, wish them well forever… We have always been there for the people of Darjeeling Hills in times of need and we reiterate that they have our all-out support for the demand of separate state of Gorkhaland,” the letter by Chamling read.